For once, something at Ponce City Market is opening earlier than expected. 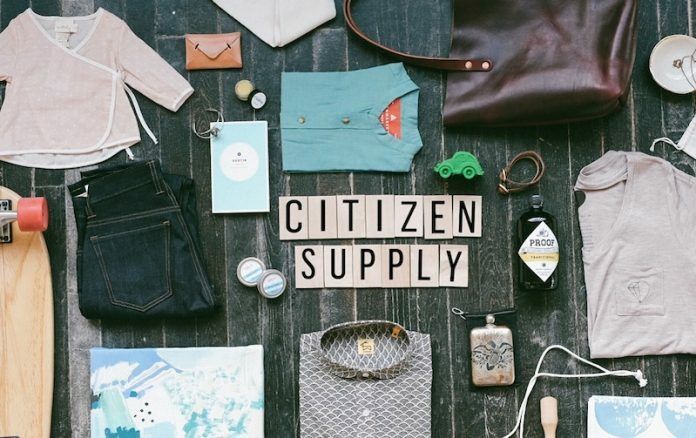 The long-ago announced “maker’s market” of artisan goods, now christened Citizen Supply, was originally scheduled to arrive next spring. Developer Jamestown recently decided to move business up for holiday shopping, and the new permanent retail fixture on the second floor above West Elm will launch tonight with a party from 7 to 11 p.m. (with bites and sips from Brezza Cucina, American Spirit Whiskey, and Wild Heaven Craft Beers, and music by Agent 45). Around 40 vendors—bringing clothing, jewelry, art, décor, even bikes—will rotate in an as-of-yet undetermined fashion, typically sticking around for weeks or months at a time. Some booths will mix several sellers in one space; others are packed to the gills with one maker’s goods and fully branded with signs and furniture like mini-stores. Sure, Citizen Supply is tapping into that small-batch, handmade, artisan devotion so popular right now, but it’s no arts-and-crafts show, with an impressive roster of young, independent brands we truly covet. Those open for the launch tonight include local favorites like ceramics line Honeycomb Studio, Britt Bass art gallery, sunglasses company Red’s Outfitters, and Melting Sun jewelry. Atlanta motorcycle co-op Brother Moto, recently forced to close its shop in East Atlanta Village, occupies a spacious stall with its cool bike-y accessories, including Sneerwell flasks and Poler jackets and packs. So far there aren’t any kids stores at Ponce City Market, but Athens-based makers Treehouse Kid and Craft, and Willaby (soft, simple, beautiful children’s clothing) fill that niche. And one of our latest local discoveries is handsome men’s line Elk Head Clothing, an impressive collection of rugged-but-modern shirting, pants, and accessories. Cult status Alabama Chanin, out of Florence (Alabama), brings its sturdy hand-sewn organic cotton garments and quilts, and Opelika’s Loyal Stricklin has set up with a booth of fine leather accessories—like ATL-stamped coasters. Others are coming from as far afield as California. Venice Beach’s Solé Bicycles will have a selection of slick fixies. The market was modeled in part after Artists & Fleas, a marketplace at Ponce’s sister property, Chelsea Market in Manhattan. To organize and curate the concept, Jamestown brought on local community enthusiast Phil Sanders, who opened the nearby creative co-working space, Foster, last year. “I just want to see Atlanta continue to grow,” he said from under a beanie hat. “The heart of this is to create sustainability for these companies”—which he says are between the pop-up and brick-and-mortar stages. Sanders’s team will merchandise and run Citizen Supply, and vendors will train staff on their products so that they never have to be present, working on a consignment-style model. Like we’ve said before, we expect it to be like a pop-up on steroids that never disappears.